A Sears location in the midst of a "going out of business" sale. Long Island, NY - October 23, 2018 - Sears, the iconic department store chain, best known for their extensive tool and automotive service departments, officially filed for Chapter 11 bankruptcy protection on October 15, announcing that they would be closing a significant number of “unprofitable” stores throughout the United States…including yet another on Long Island. The Garden City Sears store, located at 1111 Franklin Avenue, will see over 100 employees out of their jobs when the establishment closes its doors for good, likely as soon as early 2019, according to reports. Overall, over 600 Sears employees in New York will be laid off, with a total of nine stores slated to be closed as early as January, with the majority located upstate. 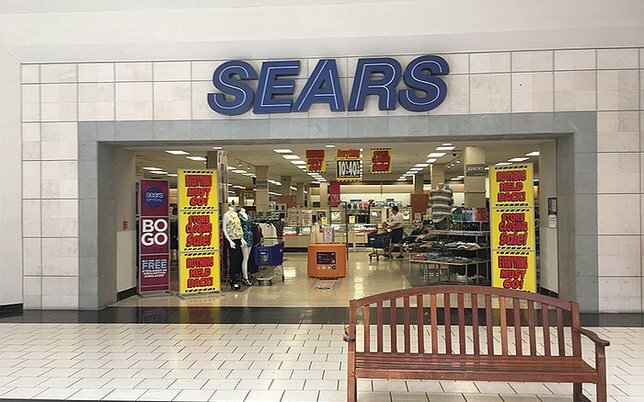 These announced store closures join a round of previously announced closures that will see other locations owned by the Illinois-based retail giant shuttered in November 2018, including a Sears in New Hyde Park and a Kmart in Riverhead. Another Sears location in Hicksville, situated across from the Broadway Mall, shut its doors for good back in April of this year. After all is said and done, the remaining Sears locations on Long Island will be in Massapequa (both the Sunrise Mall-based retail store and a separate automotive center), Valley Stream, and Lake Grove. As of the second quarter of 2018, there are currently Sears 508 locations nationwide, with an additional 360 Kmart stores – another retail chain owned by Sears – open as well. Long struggling with cash flow issues in the face of declining sales and increased competition over the years, Sears claimed a whopping $11.3 billion in debt in the face of only $6.9 billion in assets when they filed for bankruptcy this month, announcing the closure of an additional 142 stores nation-wide that have been deemed “unprofitable,” including the aforementioned Garden City location. The total number of workers set to lose their jobs as a result of these national closures is currently not known. Sears, along with many other retailers in recent years, has faced growing competition – and shrinking profits – as a result of intense competition from both big-box outlets such as Walmart and Target, as well as internet-based sellers such as Amazon, EBay, and a plethora of others. Large department stores such as Sears were previously considered “anchor tenants” at shopping malls due to their ability to attract foot traffic that smaller, adjacent stores could potentially take advantage of as well. Mall owners nationwide have been struggling to fill the mammoth spaces – often consisting of tens of thousands of square feet or more – that closed Sears locations have left in their wake, but in most cases the spaces require multi-million dollar renovations and re-fits before they are able to be used by a new tenant; that is, if a new tenant able to utilize such a large space even presents itself. Clearly, the internet has changed the way consumers are shopping these days, and it remains to be seen how brick-and-mortar retailers will evolve to survive…and how many will be left once they finally discover the way to do it. Subject: LongIsland.com - Your Name sent you Article details of "Sears Files Bankruptcy, Closing Garden City Store with a Loss of Over 100 Jobs"